A Starbucks in south Denver selects artwork from a local elementary school to be displayed for a time in their coffee shop. A client’s child was selected and it became a frequent stop for them while it was hanging, because the girl was just so excited. Fortunately, her mother recognized and seized the opportunity to surprise her daughter by framing the piece along with her entry card after it was taken down. With school budgets being cut, art class is always the first on the chopping block. I was in preschool the day that I was first complimented on my use of symmetry. I had colored a butterfly the same way on both sides, big deal. But, I will never forget the sense of pride I had taking that butterfly home, giving it to my mom and it making it’s fateful final resting place on the refrigerator. I grew up in a small town, with no custom framing business or Starbucks. I have no doubt that if my mom had the framing eduction she has now, she would have had the butterfly framed and it would still hang in her bedroom next to my hand print. Instead it went to the fridge, then under the fridge and ultimately in the the trash. Custom framing anything is an investment. 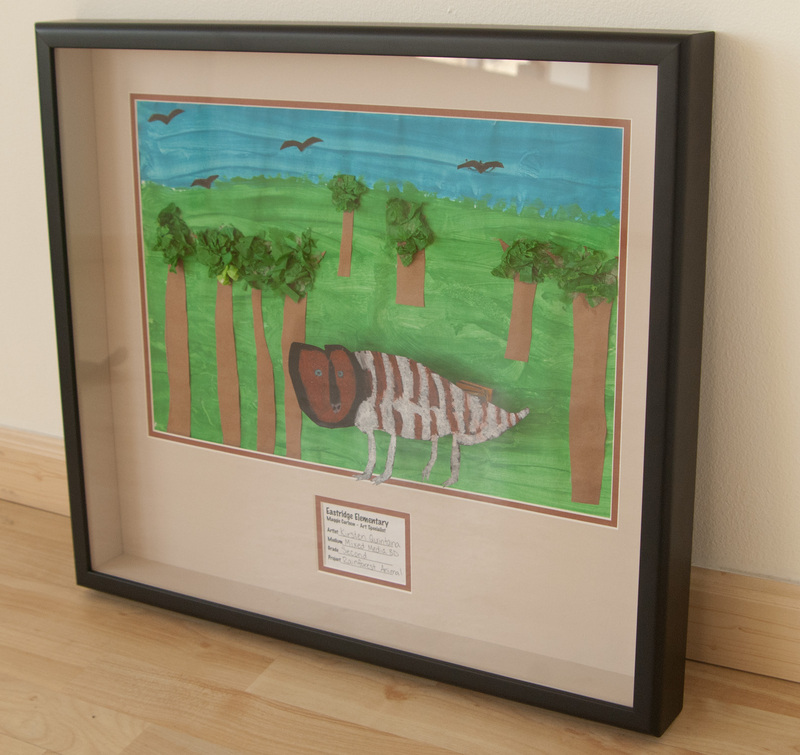 We always recommend conservation framing, even for kids art. The reality is that a limited edition print you bought from your favorite artist is more replaceable than the first dinosaur that your child drew independently, spent hours coloring just the right way and signed proudly. Whether or not you’re an artist or if your child ever aspires to be, the confidence you can give them by taking enough pride in their work to hang it prominently in your home will last a lifetime. Not to mention what it will give you to have that brief moment preserved for a lifetime. We’re honored to be hosting Dora Moore Elementary for the second year this coming April. Their art teacher, Julie Weir, teaches preschool through 8th grade and ensures that every child she teaches will have something displayed here for their friends, family and the public to view. All art will be on display for the April First Friday Art Walk and all day Saturday, April 7th. 100% of the proceeds from the art sold will benefit the children themselves and a small portion is used for their art program.